New Zealand Sky can tailor-make your next holiday whatever your budget. Given that few countries are as diverse as New Zealand, it comes as no surprise that there are lodgings for every style and budget; from sophisticated lakeside resorts, chic superlodges and designer hotels to working farms with panoramic views stretching as far as the eye can see. We check out the most swoonworthy stays in a land celebrated for its ravishing white-sand beaches, otherworldly volcanic landscapes, vast mountains, giant lakes, cosmopolitan cities and towns, and gobsmacking outdoor adventures. The scene: Arresting views of the Pacific Ocean, Cape Brett, and the offshore Cavalli Islands dominate at this Relais & Châteaux-approved luxury lodge set in 6,000 acres of breath-taking scenery near Matauri Bay, just north of the Bay of Islands (a 45-minute flight from Auckland). It also features a David Harman-designed, par 72 championship golf course overlooking the sea. The sleep: Complete with private porches, all of the 22 decadent suites offer timeless décor, tasteful soft furnishings, warm carpets, and blonde woods. Expect lavish king-size beds, seating areas with open fireplaces, his-and-hers walk-in-wardrobes, and bathrooms with oversized tubs, separate showers, twin vanities, and high-tend toiletries. The two-bedroom owner’s cottage has an infinity pool with hot tub, outdoor BBQ, cooking facilities, and amazing Pacific vistas. The stay: Given that it was voted best resort in Australia and New Zealand by Travel + Leisure, the facilities exceed expectations. Join local heritage tours, take bush walks, try mountain biking, quad biking or fishing, and book soul-soothing treatments at the sensational spa nestled at the edge of a native Totara forest. There’s also three secluded private beaches, two tennis courts, and a main restaurant for all-day à la carte gourmet dining and post-dinner drinks. The scene: Few properties in the quaint seaside town of Russell compare to this early 20th-centry house turned two-storey boutique B&B overlooking the tranquil Matauwhi Bay. You’ll also be just a short hop from the lovely cafés, restaurants, bars, art galleries, specialist shops, and exquisitely-restored historic buildings that make this place so romantic. The sleep: While all of the characterful rooms and suites are unique, each has honey-coloured kauri floorboards, an eclectic mix of contemporary and antique furnishings, Wi-Fi access, and a king or queen-size bed dressed with luxe linens, cotton quilts or feather and down duvets, and a choice of pillows. There’s also en-suite bathrooms with luxe toiletries and hairdryers. Some rooms have a private deck area where you can relax and enjoy the afternoon and evening sun. 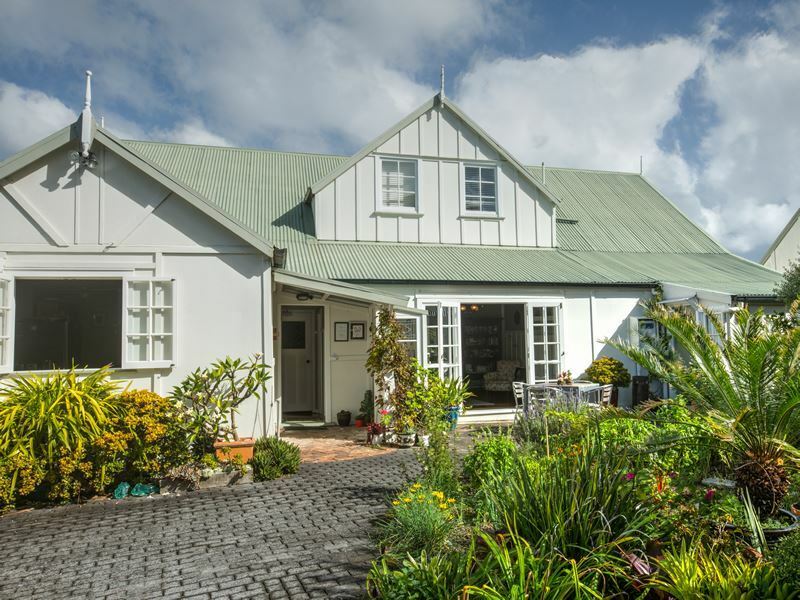 The stay: Served daily on the large front deck, breakfasts include Northland fruit, homemade mueslis, local yoghurts, jams and preserves, locally-produced coffee and teas, and delicious café-style cooked specials. There’s also two guest lounges, a kitchen, and a library stocked with books about New Zealand history, birds, plants, and Maori culture. The gracious owners live on-site and are on hand to ensure that your every whim is catered for. The scene: All plans to reconnect with nature are fulfilled at this award-winning lodge nestled in 2,500-acres of private native forest and pristine wilderness just 30-minutes south-west of Rotorua - the North Island town most famous for its geothermal activity. For golfers, the Jack Nicklaus-designed, 18-hole Kinloch Club Golf Course is just an hour’s drive away. The sleep: Complete with African game lodge-style décor mixed with Maori influences, the individually-designed lodge rooms at this tranquil paradise have king-sized beds, living and dining areas, kitchens, spa-like bathrooms, and exquisite furnishings. For those needing more space, the secluded villas, family retreat, and cottage come with open fireplaces and wonderful hinterland views. All accommodation features flatscreen TVs with satellite channels. The stay: There’s seven streams, four lakes, over 40 miles of adventure trails, and exciting activities such as trout fishing, photography safaris, guided walks, geocaching hunts, cookery lessons, and helicopter tours the nearby active volcano. 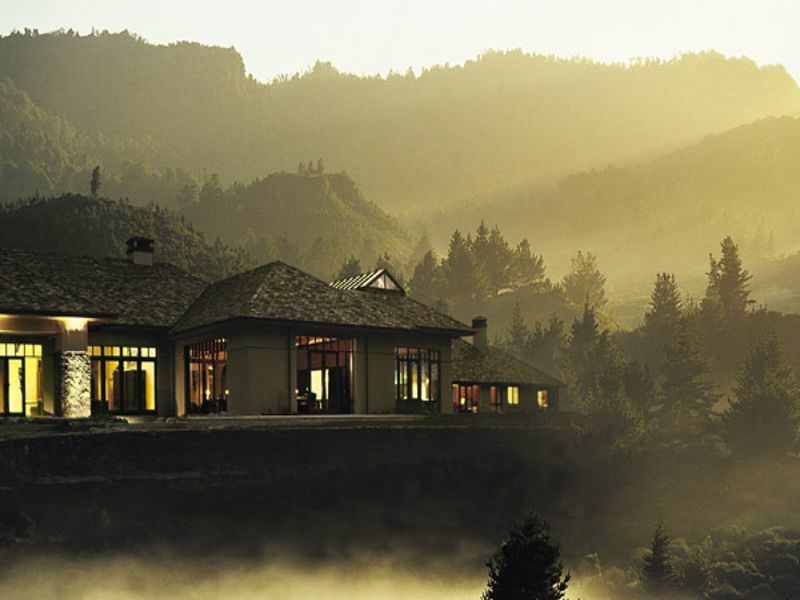 There’s also a day spa with Maori-inspired treatments and an on-site restaurant for game meats, poultry and seafood dishes infused with fresh herbs, vegetables, and estate-produced Manuka honey. 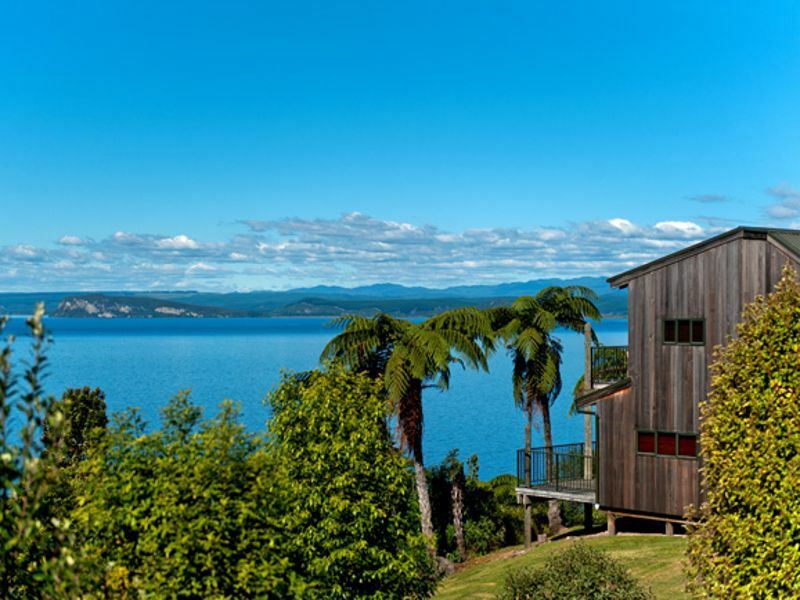 The scene: Luxury finds its home at this five-star resort at Pukawa Bay on the southern shores of Lake Taupo. You’ll also be within easy distance of Tongariro National Park - the county’s oldest national park famous for its three active volcanoes: Tongariro, Ruapehu, and Ngauruhoe (also known as the fiery Mt. Doom in Peter Jackson's film adaptation of The Lord of the Rings). The sleep: Varying in size, all of the 19 rustic-style and spacious apartments have two bedrooms (one with a queen-size bed, the other with two singles), a private balcony for panoramic views of Lake Taupo and the surrounding mountains, and a well-equipped kitchen with laundry facilities. Further creature comforts include a flatscreen TV with satellite channels, private bathroom with toiletries, and open-plan living and dining area. Undercover parking is included. 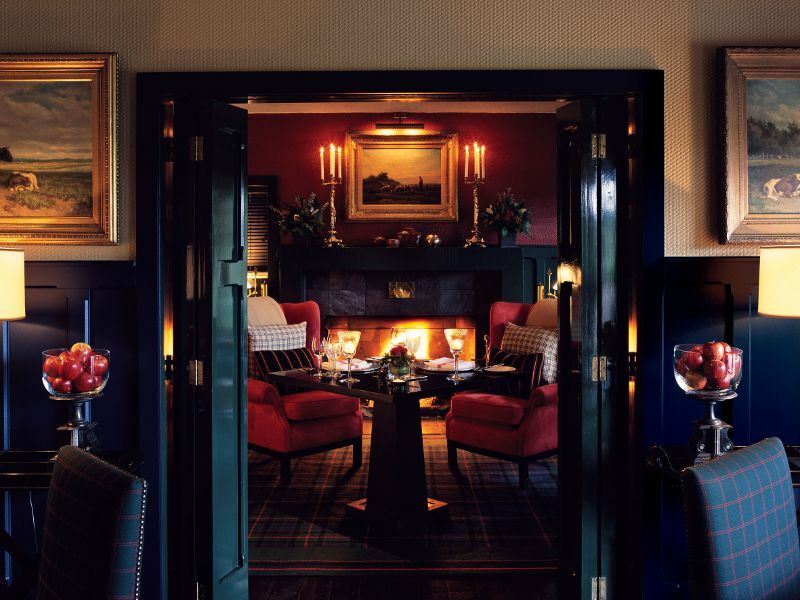 The stay: For off-duty days when you don’t fancy cooking, the cosy restaurant is worth a visit for its timber floors, open fireplaces, themed buffet dinners, and extensive wine list (the bar opens from 5pm until late on Friday, Saturday and Sunday only). The resort also has an indoor pool, tennis court, and helpful staff who can arrange trout fishing, golf packages, mountain biking, rafting on the mighty Tongariro River, and hiking the iconic Tongariro Alpine Crossing. The scene: It’s easy to see what lures style-hunters to this award-winning boutique lodge (rated as of the best in the world) set in 17 acres of manicured grounds on the bank of the Waikato River, near the cascading Huka Falls and a short hop from Taupo. The location is perfect; just a five-minute drive from the Wairakei International Golf Course and Lake Taupo. The sleep: Attention to detail is everything in the 18 beautiful lodge suites, all of which have flatscreen TVs with digital channels, CD and DVD players, iPod dock, free Wi-Fi, minibars, tea and coffee-making facilities with freshly-baked biscuits, and bathrooms with deep-soaking tubs and toiletries. For the extra wow factor, the two cottages offer substantially more living space and have kitchens, living and dining areas, outdoor decks, and heated infinity pools. The stay: The facilities are as extensive as you’d imagine: heated outdoor pool, hot tubs, gym, spa, free-to-use library, study, exquisite flower-filled gardens, and tennis, croquet and pétanque courts. There’s also a cosy bar for cocktails and canapés, a vaulted underground wine cellar for fine vintages, and 20 sublime and deliberately romantic indoor and outdoor private dining venues where you can enjoy outstanding gourmet cuisine made with sustainably-sourced ingredients. 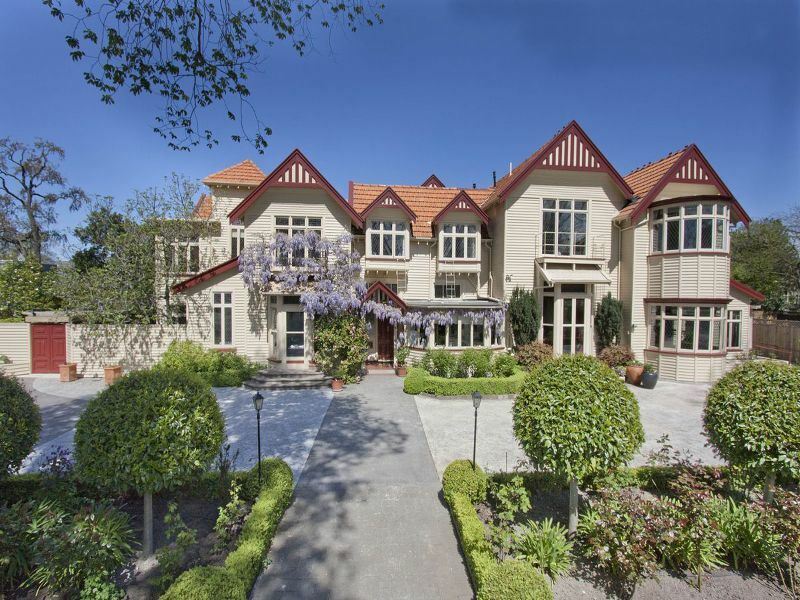 The scene: An idyllic base from which to explore the vineyards, orchards, and picturesque scenery of Hawke’s Bay, this former mansion turned boutique hotel is just 15 minutes from Napier and 10 minutes from Hastings. You’ll also be within easy driving distance of the region’s splendid wineries, restaurants, museums, cultural attractions, and cycling trails. The sleep: The guest rooms located in the historic homestead and the cottages spread across the landscaped grounds all promise historical character and modern-day luxuries. Each has air-conditioning and in-room climate controls, Smart TVs with Netflix, free Wi-Fi, tea and coffee-making facilities, laptop-size safes, and access to balconies with beautiful garden or pool views. Bathrooms have bathtubs, walk-in rain showers, and own-label toiletries. 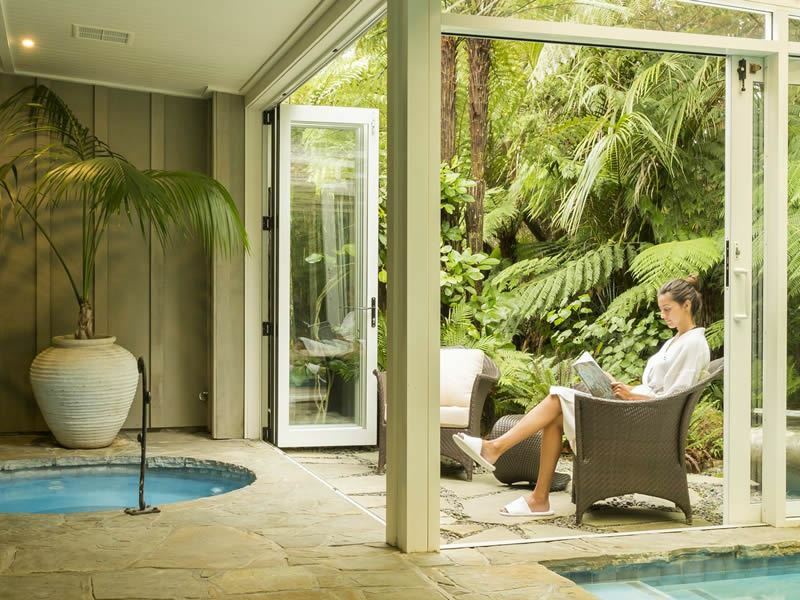 The stay: The Mangapapa Spa Sanctuary offers several Zen-like packages that include yoga and meditation sessions, access to the sauna, jet spa, outdoor pool, gym and tennis court, and treatments using plant-based products by New Zealand skincare brand, Saboré. There’s also a wonderful restaurant for dishes made with seasonal ingredients from the hotel kitchen garden and a well-stocked bar for craft beers and famous Hawke’s Bay wines. The scene: Set on a 6,000-acre working sheep and cattle farm with jaw-dropping views of the Pacific Ocean and the cape, this rustic-luxe (and Relais & Châteaux-approved) hotel is located on the craggy but stunning Cape Kidnappers in Hawke's Bay. 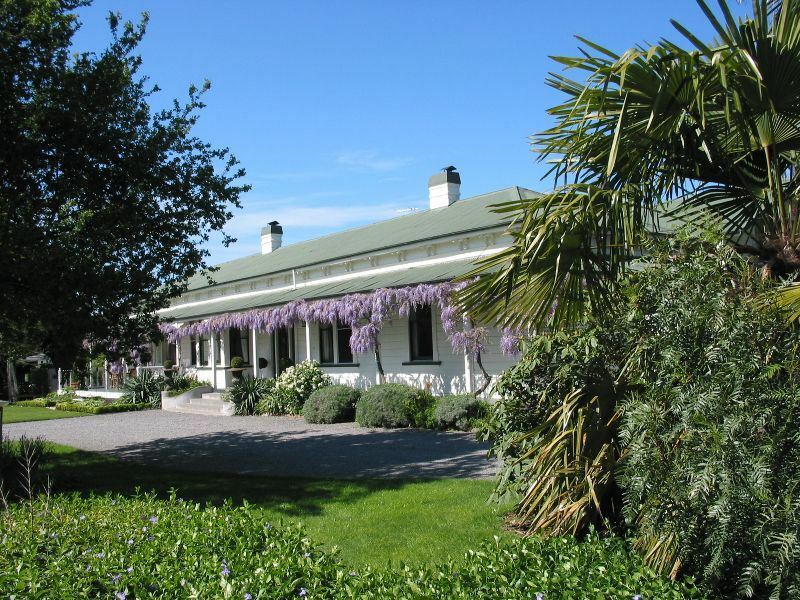 You’ll be a 30-minute drive from Napier and within easy driving distance of the world-class vineyards this place is so famous for. The sleep: There’s a rustic-luxe look in the 22 spacious guest suites, all of which are dotted across the expansive grounds. All have a private balcony, seating area, flatscreen TV with DVD player, iPod connectivity, walk-in wardrobes, and beautiful bathroom. Some of the more salubrious suites have a fireplace and arresting views along the skyline ridge (the four-bedroom owner’s cottage features an open-plan kitchen, dining, area, and outdoor Jacuzzi). The stay: Life here is focussed around the 50-foot heated infinity-edge pool with cabana, luxurious spa, and 18-hole golf course designed by world-renowned golf architect Tom Doak (completed in 2004, it has been hailed as one of golf’s greatest modern marvels). There’s also plenty of nature-based attractions such as mountain biking, rafting, fishing, guided bird-watching, and conservation walks. Equally standout is the main dining room for its all-day menu of traditional English and French dishes influenced by seasonal New Zealand produce. The scene: You’re in for a treat at this sublime Victorian homestead turned five-star boutique hotel in the heart of Hawke's Bay. Not only will you be surrounded by orchards, herb gardens and rolling countryside, but you’ll be a skip from over local 50 wineries and farmers’ markets. The magnificent harbour and port at the coastal city of Napier is a 25-minute drive away. The sleep: There’s a handful of room and suites, all of which have French doors opening onto private terraces. Expect king-size beds with Frette linens, seating areas with coffee tables, flatscreen TVs with digital channels, and free Wi-Fi. The bathrooms have walk-in showers and Molton Brown toiletries. For honeymooners or families, the large secluded cottage has a private driveway, open fire, fully-equipped kitchen, and expansive deck with outdoor bathtub. The stay: The farm-to-table cuisine is reliably good in the sophisticated dining room; expect an ever-changing menu that includes home-cooked and locally-sourced dishes accompanied by carefully-selected vintage wines. There’s also an outdoor pool lined with sunloungers, a free-to-use library, drawing room with an open log fire, and wood-panelled billiard room with full-size table. For fitness fans, the homestead old stables have been converted into a gym. 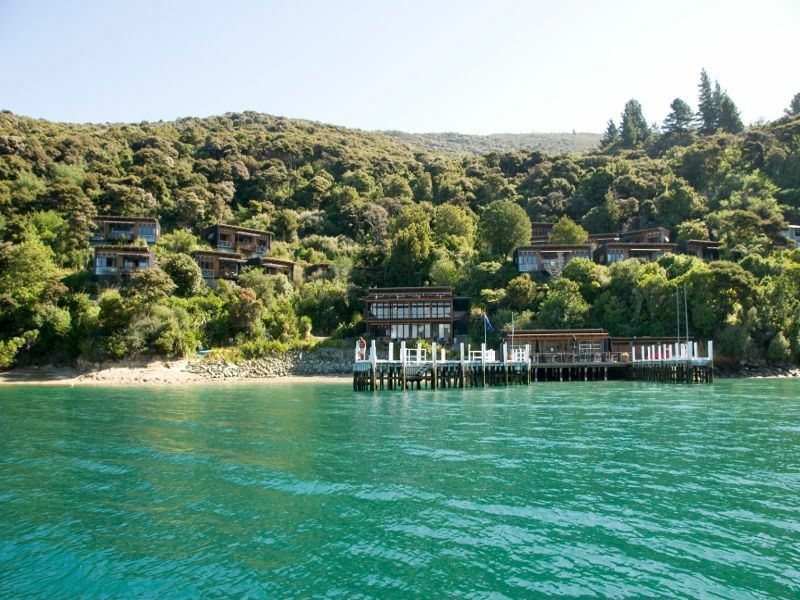 The scene: The clue’s in the title at this enchanting five-star resort accessed via water taxi through the beautiful Queen Charlotte Sound. Surrounded by native bushland, the setting is idyllic; you’ll be at the tip of New Zealand’s South Island and only a 30-minute speedboat ride from Picton in Marlborough (or a 20-minute helicopter ride from Wellington). The sleep: Characterised by rustic-meets-contemporary décor, the luxurious one, two or three-bedroom apartments are blissfully private. Expect a furnished balcony accessed from the bedroom and living room, king-size bed, kitchenette with designer appliances, en-suite bathroom with hotel-worthy amenities, flatscreen TV with digital channels, and tea and coffee-making facilities. The more luxurious suites have private entrances as well as large decks with hot tubs. The stay: The on-site helipad and the private jetty for receiving the water taxi and cruise services set the tone for the well-considered upscale facilities that follow, including a heated outdoor pool with sunloungers, fine dining restaurant, waterfront bistro, games and DVD library, and all-day lounge. There’s also free watersports (paddle-boarding, kayaking, use of a dinghy), a cedar hot tub, and a seasonal day spa for bespoke massage and other beauty treatments. 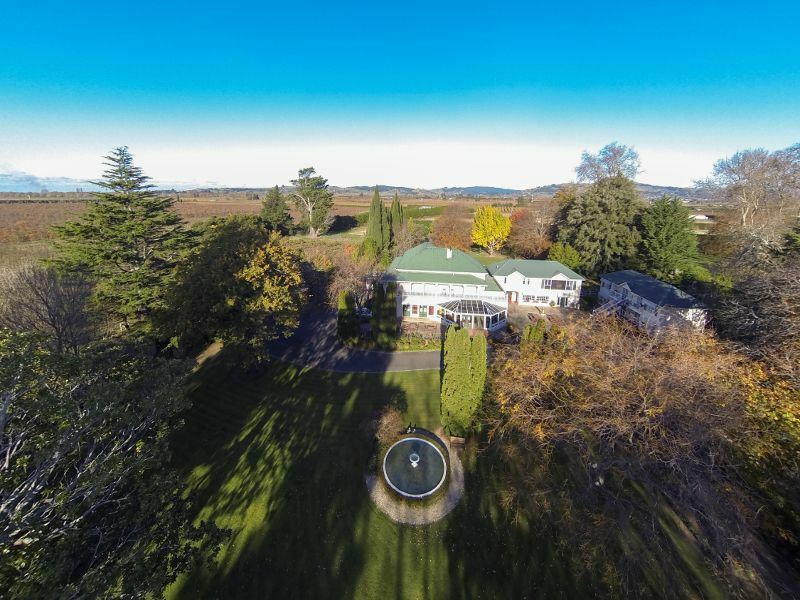 The scene: Surrounded by 10-acres of farmland, olive groves, and beautiful gardens, this gracious Edwardian villa built in 1901 is located in the heart of Marlborough’s famous wine-growing area. You’ll be five-minutes from Blenheim, and within easy distance of Marlborough Sounds, the Nelson Ranges, and the numerous Wairau Valley vineyards. The sleep: All of the five individually-designed and charmingly romantic suites have comfortable queen or king-size beds with high-quality linens and electric blankets, flatscreen TVs with digital channels, free Wi-Fi, fridges, minibars, and tea and coffee-making facilities. Complimentary home-baked cookies and fresh fruit are a thoughtful touch. There’s also private terraces or balconies, fireplaces, and bathrooms with toiletries and soft bathrobes. The stay: There’s no on-site restaurant, but breakfasts are served daily in the dining room (or outside on the terrace if the weather’s good). There’s also an on-site boutique vineyard, olive grove, outdoor swimming pool, and grounds for games of pétanque or croquet. The owners can arrange all sorts of excursions, including rounds of golf at the nearby Marlborough Fairhall Championship Golf Course (green fees are free of charge for hotel guests). The scene: An iconic Marlborough Sounds seaside escape since the 1930’s, this waterfront lodge is hidden away along the scenic shore of Kenepuru Sound and surrounded by nearly 20 hectares of peaceful native bush land and extensive lawns. The views are mesmerising; think sheltered beach, glistening coastal waters, and soaring mountains. The sleep: Following a top-to-toe refurb in 2014, all of the 14 luxurious and contemporary-style rooms have a balcony or courtyard (perfect for nightly stargazing), comfortable super-king beds (or twins), tea and coffee-making facilities, and beautiful views of the expansive gardens or the sparkling blue Kenepuru Sound. There’s also spacious dining, living, and outdoor entertainment areas and en-suite bathrooms with soft bathrobes, toiletries, and heated towel rails. The stay: Days here can be spent sailing, diving, boating, hiking, fishing, and playing golf (the lodge also offers free kayaking, paddle-boarding, and mountain biking). Facilities include a casual yet sophisticated restaurant for mouth-watering local cuisine and gorgeous views over the water, a relaxed lounge and bar for anytime drinks and snacks, and a new 20-metre floating jetty that makes arrival by boat hassle-free (moorings are also available). 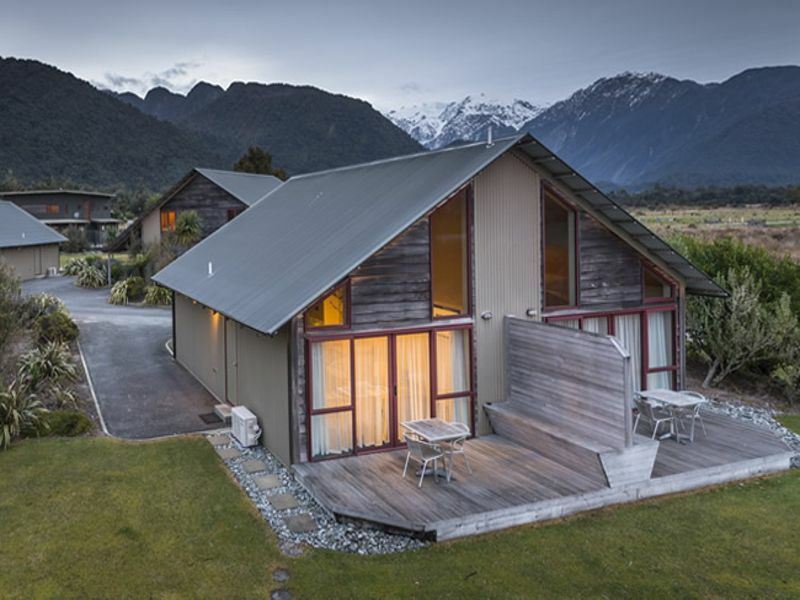 The scene: Located on State Highway just under two miles north of the Franz Josef Glacier township, this collection of one and two-bedroom villas makes an ideal base for exploring the Glacier region and the West Coast. For adventurous types, activities include guided walks, fishing, mountain biking, heli-hiking on the glacier, and discovering secret waterfalls. The sleep: All of the contemporary villas have queen or king-size beds, furnished private decks with rural or alpine views, lounges with sofas, coffee tables and flatscreen TVs, dining areas with seating, and bathrooms with large tiled showers. There’s also fully-equipped kitchens with ovens, stoves, microwaves, and ample crockery, cookware, and cutlery. The two-bedroom is far more spacious and has a downstairs and upstairs bedroom. 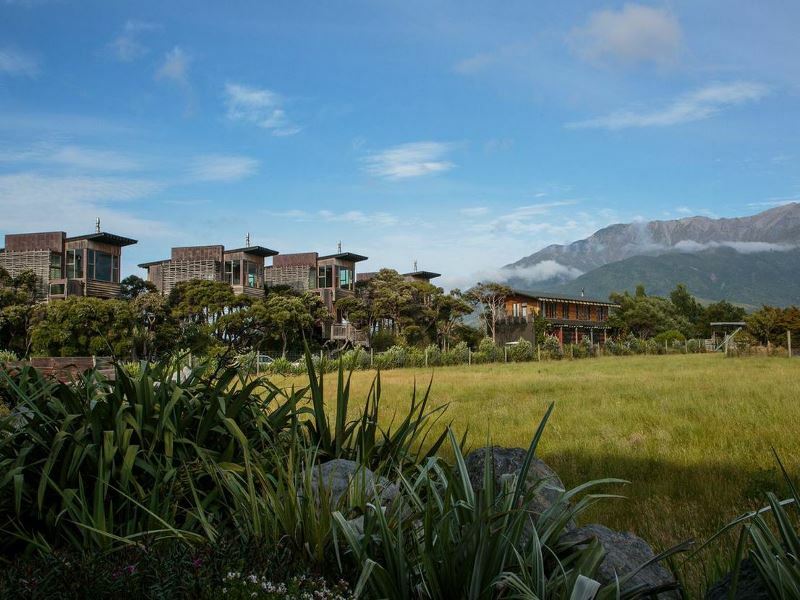 The stay: While most the action takes place in and around the Franz Josef Glacier township, there’s enough here to keep you busy: DVD library, gas barbecue, snack bar, free-to-borrow mountain bikes, and children’s playground. The owners will also arrange any number of exciting glacial adventures; from scenic helicopter rides over this remarkable landscape to guided tours that get you close to the ice caves, tunnels, seracs and crevasses. The scene: Built in 1861, this historic building turned intimate B&B boutique hotel is located in Christchurch - the vibrant city that tempts with amazing street art, eclectic shops, state-of-the-art architecture, and a booming arts scene - all the while staying true to its heritage and traditional English feel. The Hagley Golf Course is a 20-minute walk from the property. The sleep: There’s eight spacious rooms, all of which delight with classic décor and contemporary en-suite bathrooms. All have a queen or king-size beds dressed with crisp white linens, flatscreen TVs with digital channels, tea and coffee-making facilities with homemade biscuits, and irons and ironing boards. The larger heritage rooms have bathrobes and DVD players. With the exception of one room, all accommodation is upstairs (there is no lift). The stay: Available daily, breakfast includes a selection of cooked dishes as well as continental goodies like seasonal fresh fruit, cereal, and yogurts. There’s also a guest lounge and a private courtyard where you can relax with a drink from the fully-licensed bar. Delicious afternoon teas are another highlight; order a tiered platter filled with savoury and sweet delicacies such as scones and cakes and enjoy Harney & Sons tea served in fine bone china cups. The scene: South Island addresses don’t get better than this country retreat located on a deer breeding farm at the base of the Kaikoura Seaward Mountain Range, with the rugged Kaikoura coast and famed Mangamaunu Bay just over half a mile away. 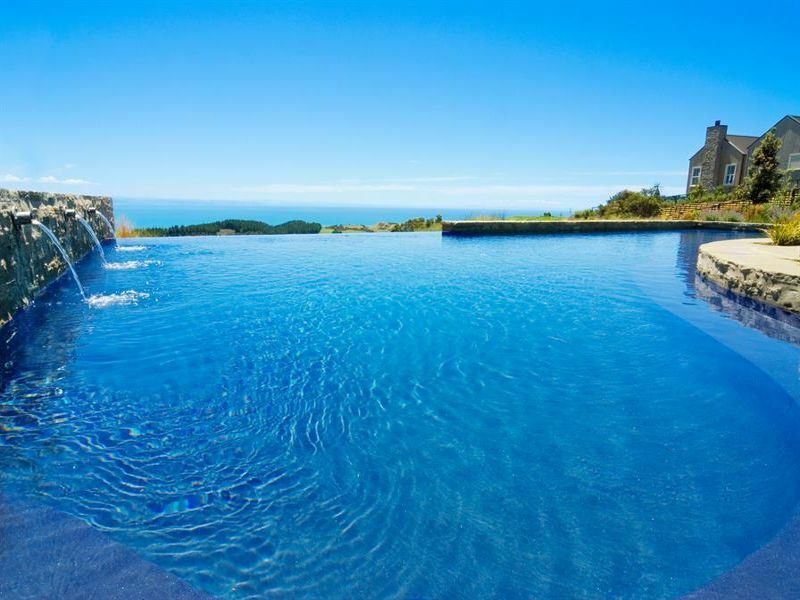 You’ll also be a 10-minute drive from Kaikoura, the eco town most famous for its whale-watching opportunities. The sleep: The visual thrills continue in the beautiful rooms and suites, all of which are kitted out with wood panelling, neutral hues, and super-king beds with soft lambs’ wool mattresses. There’s also flatscreen TVs, DVD players, iPod sound systems, and bathrooms with rainforest showers and soaking tubs for two. The five unique treehouses nestled 10 metres above ground have master bedrooms and impressive views of Kaikoura's dramatic mountains and the Pacific Ocean. The stay: Facilities include a main restaurant serving cuisine created from local or home-grown ingredients, a solar-heated pool, and a hot tub. Spa treatments are available on request. There’s also free-to-borrow mountain bikes and heaps of outdoorsy activities such as hiking, coastal walks, golf, horse riding, and whale-watching tours (Kaikoura is home to a permanent population of bachelor sperm whales that can be visited just a couple of miles offshore). 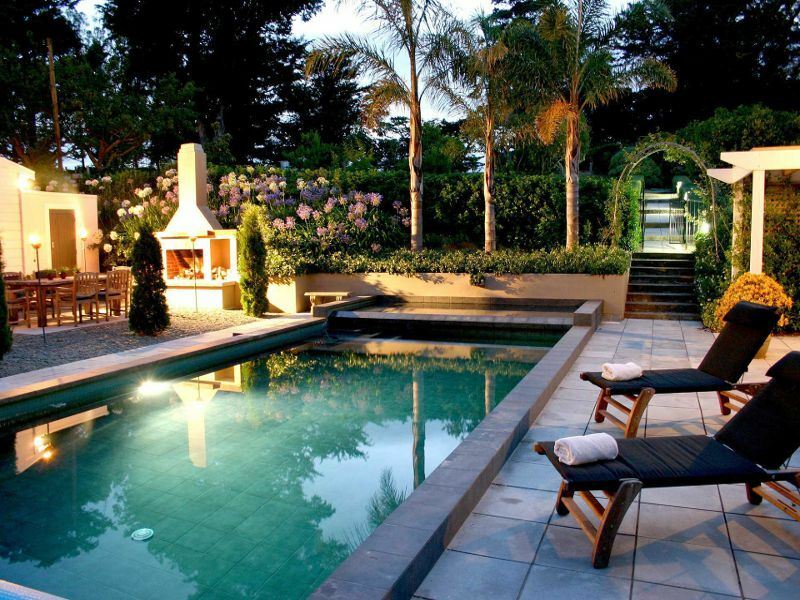 The scene: The only luxury five-star boutique hotel in Christchurch with a one-to-one staff to guest ratio, this stylish sanctuary ups the ante with a dramatic location overlooking the picturesque Hagley Park and the gentle River Avon. You’ll also be within easy of Christchurch’s cultural attractions, including the Botanic Gardens, Canterbury Museum, and Restart Mall. The sleep: Varying in size and layout, all of the 53 Warren & Mahoney-designed rooms promise sophisticated and sleek décor, king-size beds (or twins) with luxurious bedding, underfloor heating, night sensor lighting, flatscreen TVs with digital channels and pay-per-view movies, free Wi-Fi, and safes with built-in laptop chargers. All accommodation has elegant white tiled bathrooms with showers or bathtubs, heated mirrors, bathrobes and slippers, and toiletries. The stay: Under the helm of Executive Chef Antony Page, the contemporary and seasonal menus at the hotel’s two award-winning restaurants are worth the stay alone. Head to Pescatore for delicious New Zealand cuisine that fuses modern and traditional cooking techniques (the seafood dishes are exceptional) or head to 50 Bistro for more laid-back offerings as well as cocktails and bar snacks. High teas are also available during selected hours. 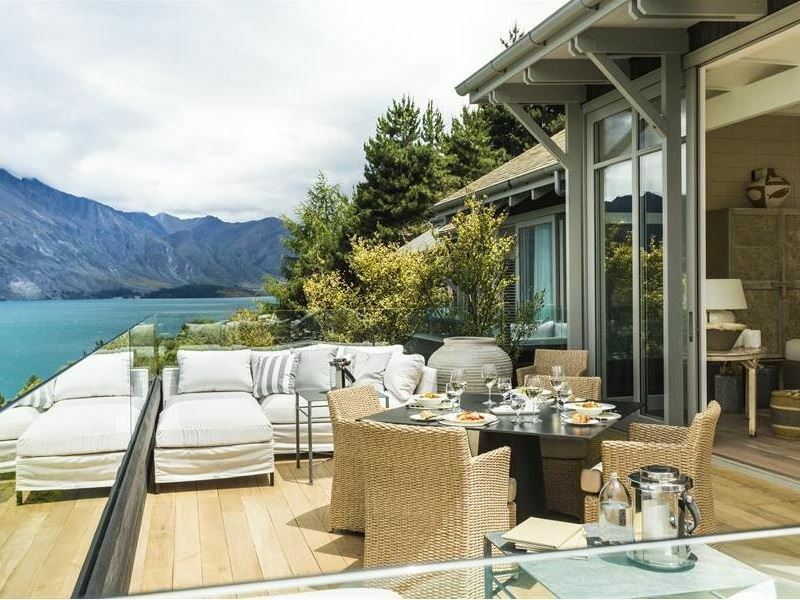 The scene: Overlooking Lake Wakatipu and The Remarkables mountain range, this peaceful five-star hillside hideaway makes the most of its truly incredible views. You’ll be just a five-minute drive from downtown Queenstown, the sleepy village turned Adrenaline Capital of the World (the world’s first bungee business was launched on the historic Kawarau Bridge in 1988). The sleep: Dotted around the hillside, the nine chalet-style villas have open-plan living and dining areas, floor-to-ceiling windows, and private sun decks with garden furniture. Each has a king-size bed (or twins) dressed with high-quality linens, flatscreen TV with digital channels, DVD player, and free Wi-Fi. There’s also a gorgeous bathroom with Linden Leaves toiletries and a heavenly tub designed to make you feel like you’re bathing outdoors. The stay: Breakfasts, afternoon teas, and evening drinks with canapés are available in the two spacious communal guest lounges (or in the privacy of your own villa). There’s also free-to-borrow games and DVDs, free private shuttles to and from the town centre, and a helpful concierge team who will sort out reservations at Queenstown’s best restaurants. 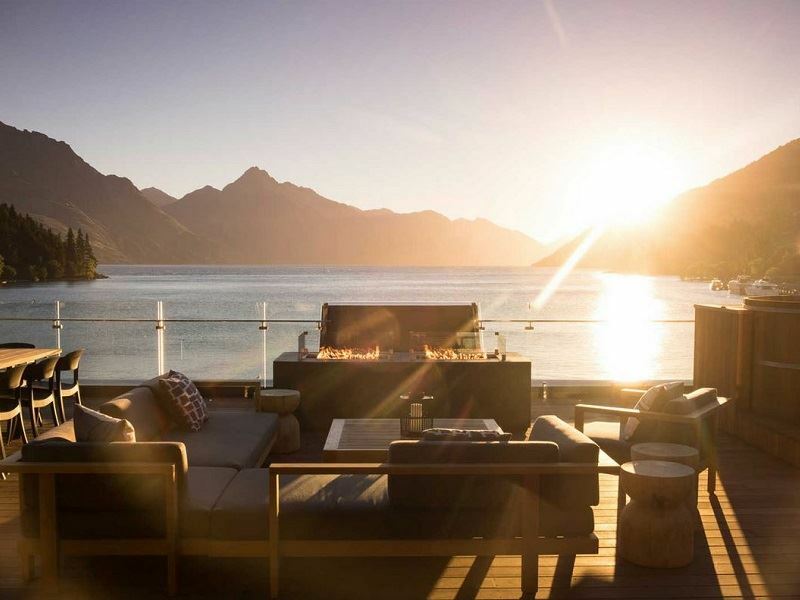 The scene: Just a seven-minute drive from Queenstown, this exceptional five-star luxury lodge overlooks the lightening-bolt shaped Lake Wakatipu - the third-largest lake in New Zealand at 52-miles and also the longest. The views are worth getting your camera out for; expect to see the Remarkables, Cecil and Walter Peak mountain ranges from literally every angle. The sleep: Designed by Auckland-based interior decorator Virginia Fisher, all of the rooms and suites have the wow factor. Expect a private balcony, seating area, open fireplace, walk-in wardrobe, and bathroom with large shower and deep-soaking bathtub for two. If you need more living space, the four-bedroom owner’s cottage is a freestanding residence complete with a Jacuzzi, kitchen, study, main lounge, dining room, courtyard, and dramatic Lake Wakatipu views. The stay: You’ll have access to a wealth of facilities, including indoor and outdoor dining, infinity pool, fitness centre with Jacuzzi and sauna, and nearby cycling trails (bikes are available). Given its fabulous location, there’s also plenty of adrenaline-charged activities on offer just down the road, including skiing, trekking, and heli-tours. The hotel can also arrange trips to the spectacular Gibbston Valley wine region (also known as the Valley of the Vines). 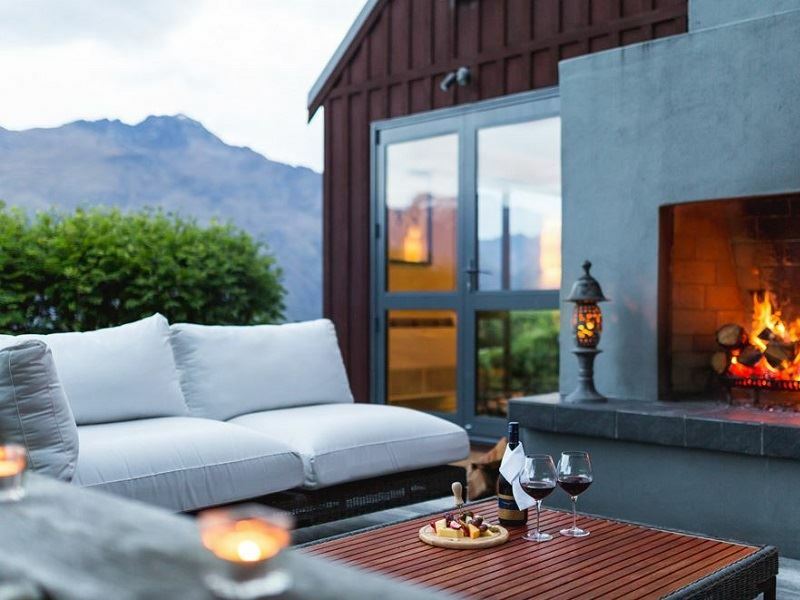 The scene: Less than a two-minute walk from Queenstown’s centre, this charming boutique hotel is perfect for those wanting small-scale luxury as well as beautiful views of the mountains and lake. Built around the town’s original dairy and corner store dating back to the 1920s, the property has been cleverly converted and recently refurbished throughout. The sleep: Complete with boutique-chic wallpapers and tasteful soft furnishings, of the 13 character-filled rooms have Queenstown-flashing views, comfortable beds with Egyptian cotton sheets and luxe linens, flatscreen TVs with digital channels, free Wi-Fi, air-conditioning, heating, and tea and coffee-making facilities with freshly-baked cookies. 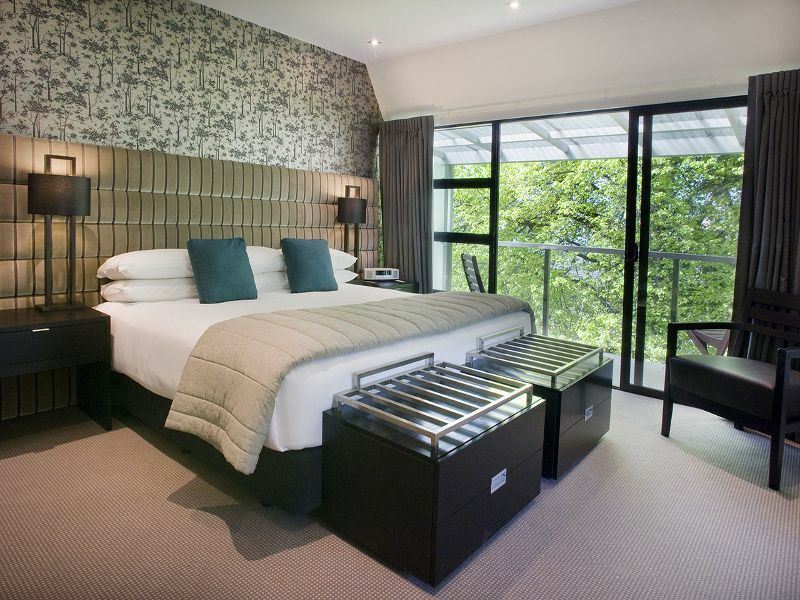 The en-suite bathrooms have a heated towel rail, hairdryer, bathrobes and slippers, and Molton Brown toiletries. 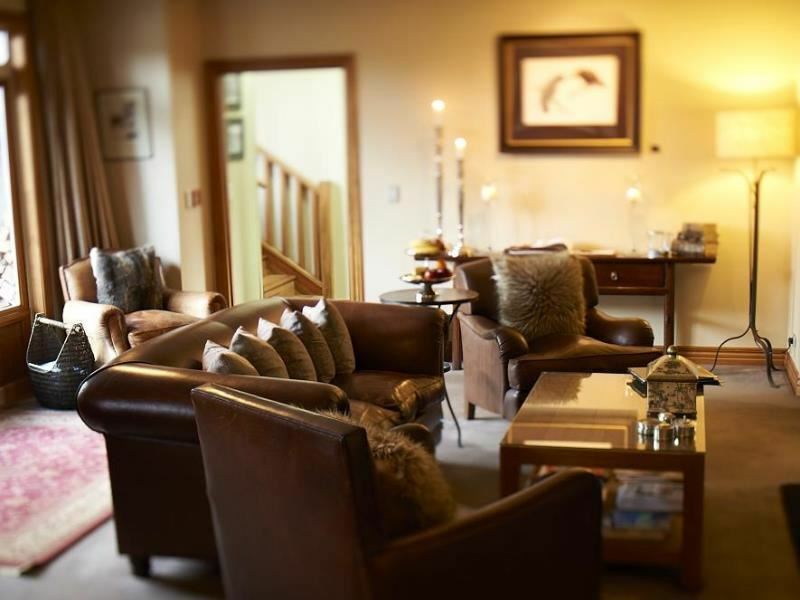 The stay: There’s a dining room for gourmet or continental breakfasts, a stylish lounge with generous leather couches and a roaring fire, and a guest library for quiet reading time (or a couple of glasses of local award-winning Pinot Noir). The hotel also has luggage storage for those hiking one of the many multi-day tracks, drying room for skiers and snowboarders, and outdoor hot tub from where you can relax and watch the sun go down. The scene: Urban chic at its best, this ultra-modern five-star hotel minutes from Queenstown’s famous attractions is on the pedestrianised Church Lane (the property inherits its name from the nearby St. Peter’s Church). You’ll also be just a 25-minute drive away from Arrowtown, the quirky gold rush village nestled below the peaks that surround the Arrow River. The sleep: Style-lovers will appreciate the design touches in the 10 suites; think large furnished balconies (some with church courtyard views), king-size beds, flatscreen TVs with digital channels and DVD players, stone clad fireplaces, and New Zealand artworks. Other upscale amenities include tea and coffee-making facilities, Wi-Fi access, iPod connectivity, and a minibar. The spacious bathroom has double vanities, separate shower and bathtub, and toiletries. The stay: Should you wish to explore further afield, the hotel has a small fleet of Range Rovers and drivers. There’s also a well-stocked DVD library and free access to the cardio machines, weights, personal training and fitness classes at the nearby Queenstown Gym. Equally standout is the signature restaurant and bar No5 Church Lane; not least for its locally-sourced Northern Italian and Mediterranean style cuisine, vegetarian dishes, and extensive drinks menu. 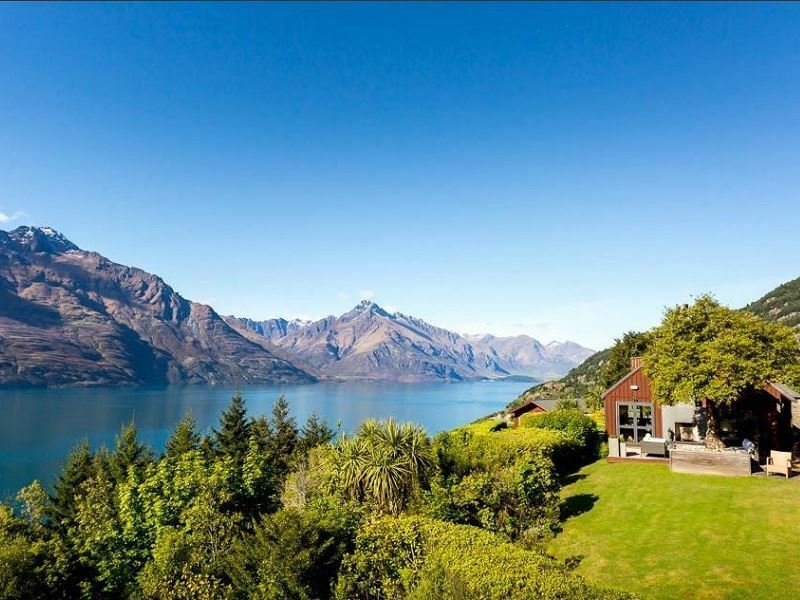 The scene: Facing out across the glittering Lake Wakatipu and offering romantic views of the marvellous mountains, this elegant, award-winning, and very intimate retreat dates back to 1866. Not only will you be just a short hop from the city’s restaurant precinct, but you’ll be a 35-minute drive from the skiing and snowboarding action at The Remarkables Ski Area. The sleep: Take your pick from five suites, four boutique apartments, and a peaceful private lakeside residence and penthouse - all designed by Virginia Fisher. Each boasts a generous amount of living space as well as a super-king bed, dressing room, cosy gas fireplace, flatscreen TV with digital channels and DVD player, free Wi-Fi, and well-stocked minibar. Bathrooms have bathtubs, separate showers, heated mirrors, fluffy towels, and hand-made toiletries. The stay: Like its sister property, The Spire, guests have free access to the cardio machines, weights, personal training and fitness classes at the nearby Queenstown Gym. 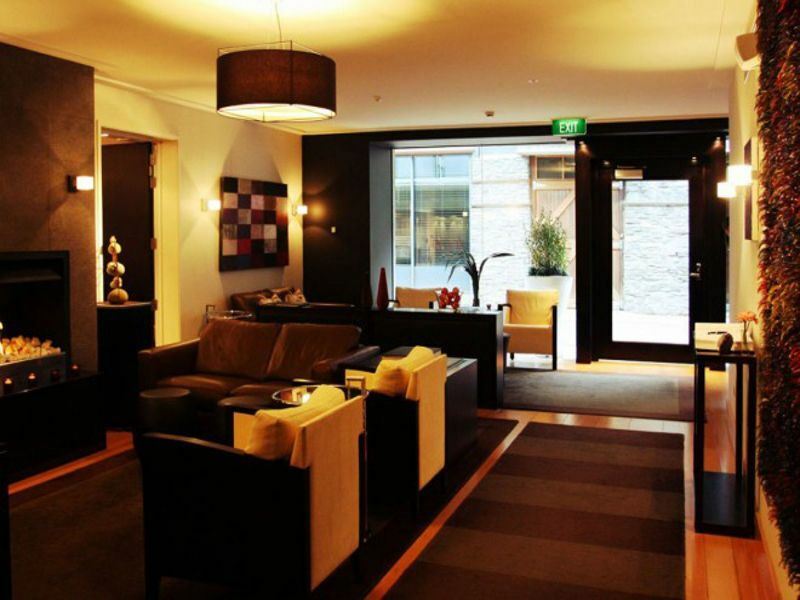 The hotel also has an extensive DVD library and a sophisticated bar for cocktails and tapas (it’s also the only place in Queenstown to serve Bollinger champagne by the glass). Equally memorable is the contemporary brasserie-style cuisine at The Grille, the hotel’s flagship restaurant. 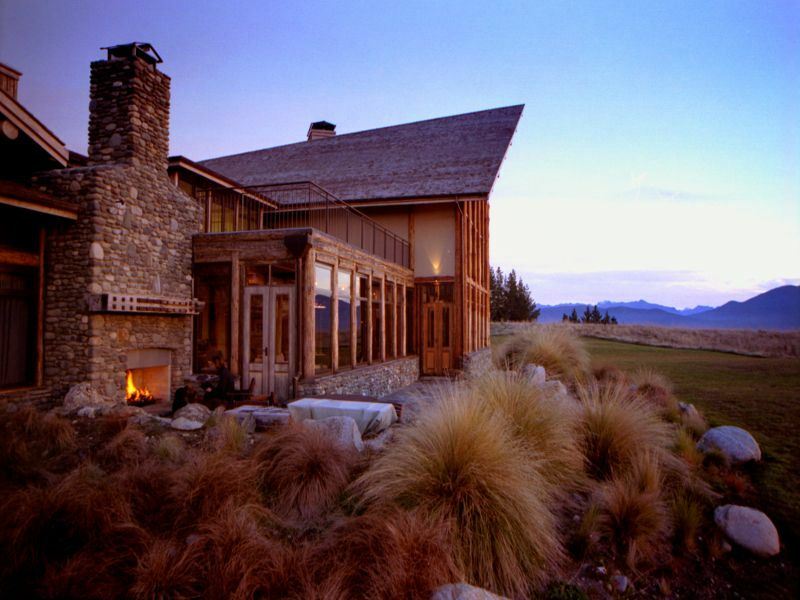 The scene: Set in a World Heritage Site, this contemporary lodge with uninterrupted views across the stunning Lake Te Anau was built in 2002. The location is perfect for exploring Milford Sound, Doubtful Sound, and the glacier-carved wilderness that is Fiordland National Park. You will also be within easy distance of the extraordinary Te Anau Glowworm Caves. The sleep: There’s 10 luxurious lodge rooms as well as two separate self-contained loft-style cabins, all of which feature king-size beds, well-appointed private bathrooms, and a décor scheme that reflects the Fiordland landscape (the look is muted natural colours, raw fibres, and river stone for a sense of serenity). Homely touches include tea and coffee-making facilities, flatscreen TVs with digital channels and DVD player, and outdoor space (a balcony or lawn). The stay: Excursions and experiences include guided nature walks to Key Summit on the famous to Routeburn Track and catamaran cruises on the Doubtful Sound. The lodge can also arrange fly-fishing, jet boat rentals, photography trips, cycling routes, and more. 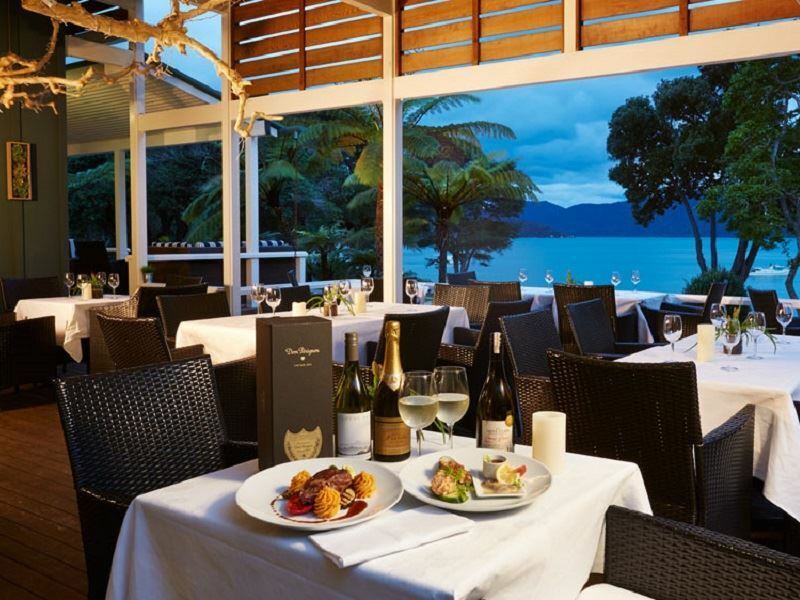 For wining and dining, the lodge restaurant showcases traditional New Zealand dishes (lake fish and game) made with fresh, seasonal, locally-sourced and mostly organic ingredients.